A few years back I went on a frustrating search for a perfect sandy tan color nail polish. Everything I found was too brown or too yellow. I gave up eventually, sad and broken hearted. Then, I opted into a great deal on 3 butter LONDON polishes and found myself face to face with All Hail the Queen, my perfectly sandy beige polish. 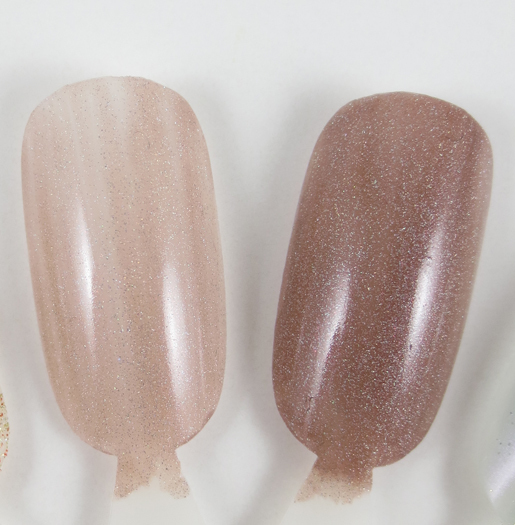 All Hail the Queen is a rosey taupey sand color with a hint of pink iridescence and silver and pink micro sparkle. I love this polish! The color was exactly what I was looking for, a beachy beige that was neither too brown or too yellow. 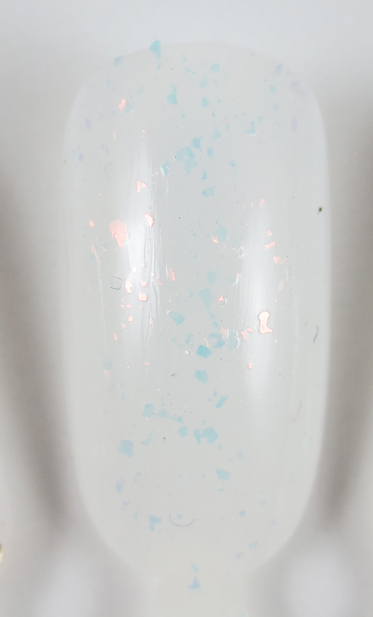 The little hint of pink you catch as you move your fingers is very pretty and makes this polish a lot more interesting when you see it in person. 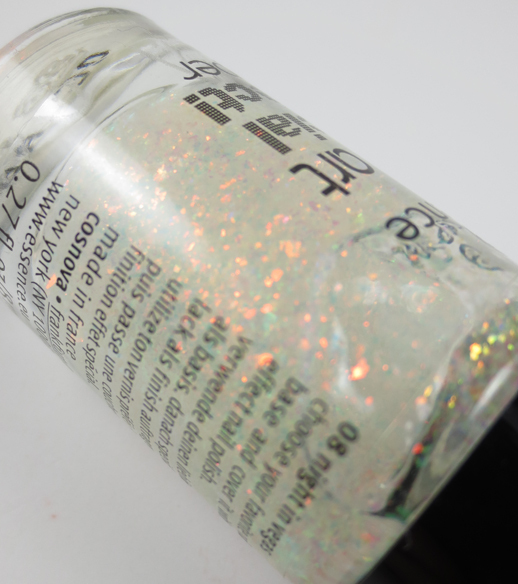 The polish formula is smooth and easy to use. It is neither runny nor thick and you easily reach opacity with two coats. 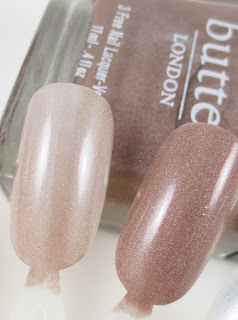 The one issue I've had with butter LONDON polishes is their tendancy to flake around the tips after a few days of wear. I am very hard on my nails so maybe this isn't a fair test, however where some polishes chip, this one seems to flake. 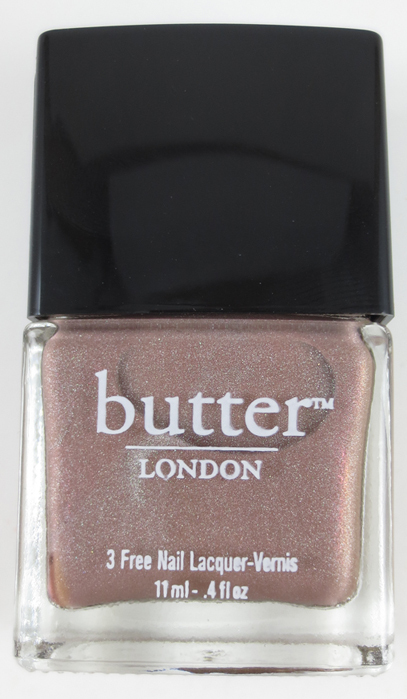 It is that tendency to flake that keeps me from buying more butter LONDON polishes. At the very least I will wait for a sale of some sort, because they do have quite a few shades I would love to try. 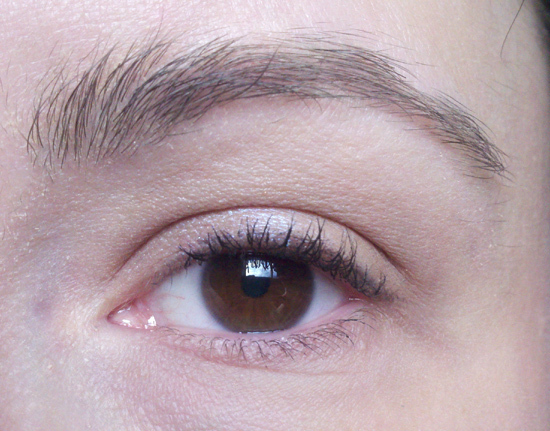 Last year I was turned on to the services of Anastasia, a brand synonymous with neatly groomed and shaped eye brows. 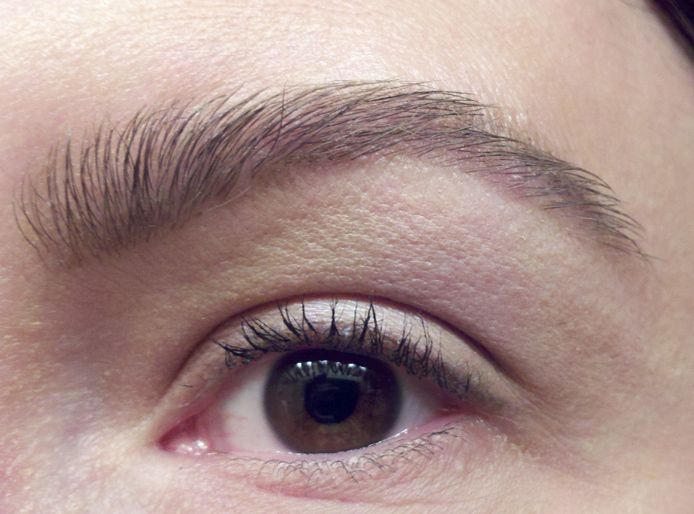 Having suffered a few self inflicted eye brow tragedies, and a few I paid good money for, I was happy to find an eye brow service I could trust. One of the first products I bought from Anastasia was a pack of eye brow stencils. My eye brow consultant helped me find my correct shape, High Arch, and after seeing it in action, it was a no brainer to pay the $20 for the stencil pack. 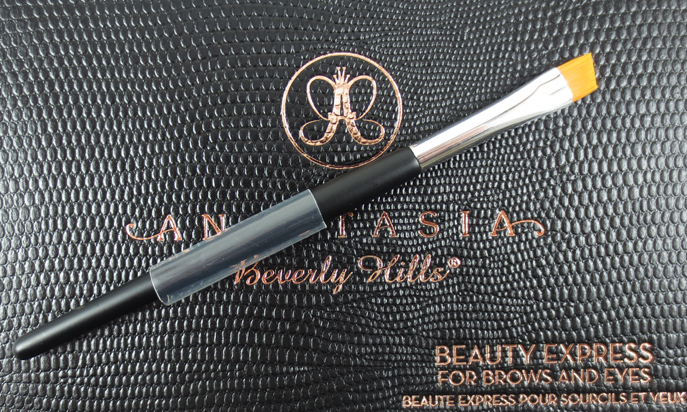 As time passed, I wanted to enhance my eye brow wardrobe so I decided to pick up the Anastasia Beauty Express Kit for Brows and Eyes. This kit has everything you need to style and groom your brows. 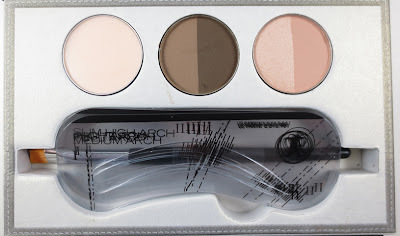 It comes with cream brow shaping wax (top left pan) two shades of eye brow powder to fill in your brows (this kit is Brunette), and two neutral shadows (one matte, one shimmer) that can be used to highlight your brow bone. 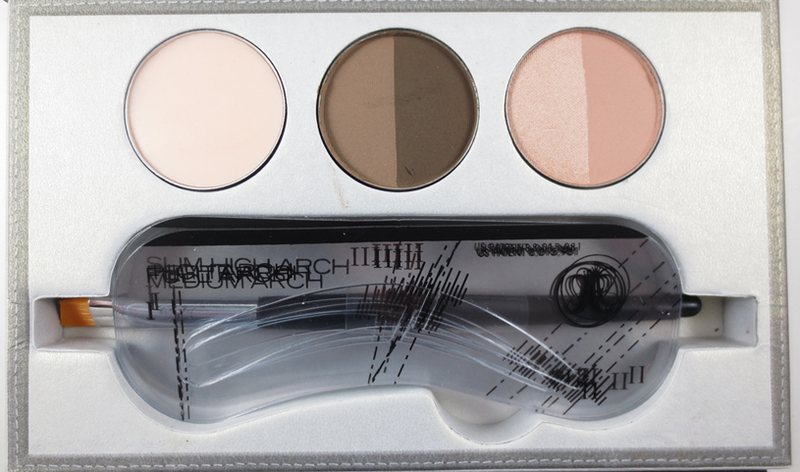 It also comes with 5 stencils for various brow shapes and a high quality angle brush to apply the powder/waxes to your brows. The brush is made of dense synthetic fibers and can be used with the wax or the powders. I like to use this for the wax since it is stiffer, for the brow powder I use something slightly softer like a MAC 266. I think it gives a more natural line that won't require as much softening after the fact. The Anastasia Beauty Express Kit comes with five eye brow stencils. 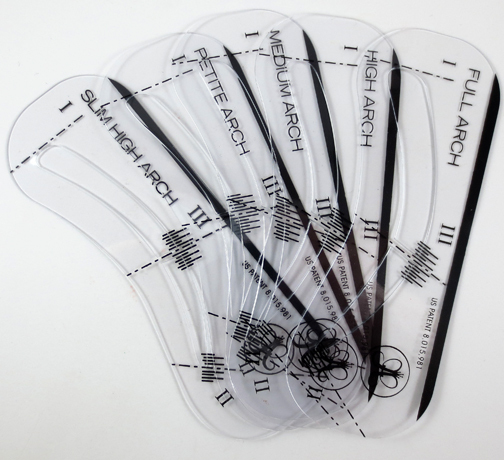 Slim High Arch, Petite Arch, Medium Arch and Full Arch. You can mix and match stencil if needed to find your perfect shape. First, I can't recommend Anastasia's eye brow shaping services enough. I've paid decent money for some truly awful eye brows. The Anastasia artists work with your natural shape and fullness to give you the most flattering brows for your face and they show you everything and explain it so you can get the same results at home. I spend $30 every 6-8 weeks and it is well spent. 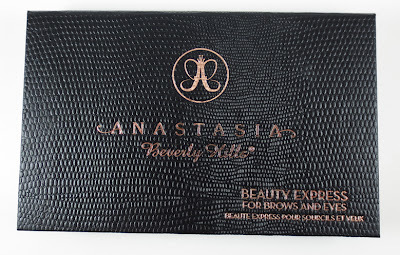 The Anastasia Beauty Express Kit is amazing for the price. It retails for $39.50 and contains over $100 worth of product in a kit that fits in the palm of your hand. The set of 5 stencils alone retails for $20. This is just an amazing value for your money and it will last you forever! Currently looks as if this kit is offered in Blonde and Brunette. The kit pictured here is Brunette. Where to Buy: Sephora or Nordstrom or your local Anastasia Counter. I have so many wonderful Essence top coats to share with you all! Their line of Special Effect Nail Toppers are a fun way to add some flair to your existing nail polish wardrobe. The first topper I tried way back when was Night in Vegas. Night in Vegas is an iridescent flake top coat consisting of flakes suspended in a thick clear jelly base. These flakes flash from gold, to copper, to green depending on the way the light hits your nails. Night in Vegas over a bare nail. Here is where this top coat comes to life. Here is one coat over Wet 'n' Wild Ebony Hates Chris. 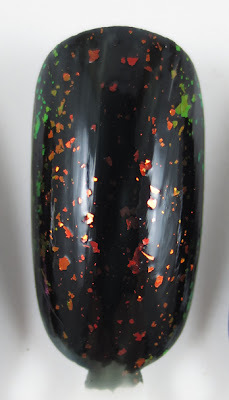 When used over a dark base this top coat shows it's inner fire. Night in Vegas is simple, yet stunning. I've used this with a few simple tape manis and over the tips of a french manicure and it does a great job of adding visual interest to you nails. The formula is thick and can be a little tricky to work with. The key is to apply a thin coat over your base color. You don't need to hunt for flakes or apply multiple coats. One thin coat will give you great coverage and tons of flakes. Occasionally if I am tough on my nails, I get some chips around the tips, but nothing consistent. So far I'm up to 6-7 Essence top coats and I love every one. A few weeks ago I was approached about testing and reviewing the Spa Sonic Skin Care System. I had not heard much about the Spa Sonic Skin Care System prior to this contact, however it seemed like a product many would be interested in, so I enthusiastically agreed. The Spa Sonic Skin Care System is described as a face and body polisher, that both cleans and exfoliates. It uses a variety of rotating heads to clean, buff, smooth and polish the softest and roughest parts of your body. 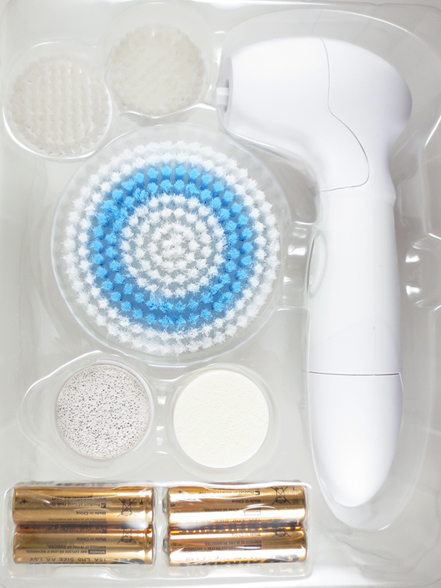 The Spa Sonic Skin Care System is ready to go right out of the box. This is what you get with the Spa Sonic Skin Care System. It comes with everything you need to get started, even the batteries!! You get the hand held wand, two small face brushes, one large body brush, one facial sponge and one pumice head. The two small face brushes are compact and incredibly soft, softer then the Clarisonic senstive skin brush head I've been using. 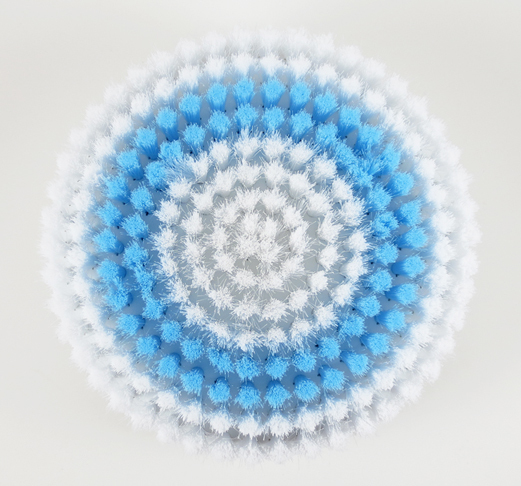 The bristles are more densely packed then the Clarisonic heads and are about 1/2 the size in total surface area. Two unique features are the pumice and sponge heads. The pumice head is pretty smooth, still pumicey (made that word up) but not jagged like some of the cheap pumice you buy to scrub your feet. I was afraid of the pumice head after some aggressive pumiceing I did years ago on my rough, Hobbit like feet. However, when used over shower softened skin, I found it easily buffed away rough patches without leaving my skin raw. It couldn't eat through all my calluses, but it made a difference to be sure. 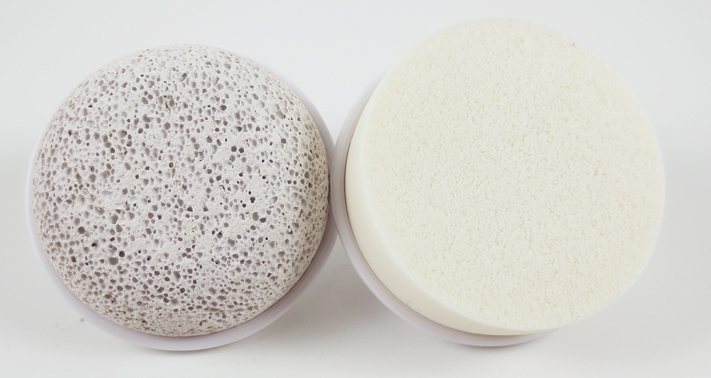 The sponge head feels like a dense cosmetic wedge sponge, with a cushiony feel. It is a microderm abrasion head designed to stimulate skin cells and improve skin elasticity. I will admit, do to some pre-exsisting skin concerns, I have not tried the microderm abrasion sponge head. But it seems intriguing and is pleasing to poke. The body brush is about 4x the size of the small face brush. It is soft, but stiffer than the small face brushes. 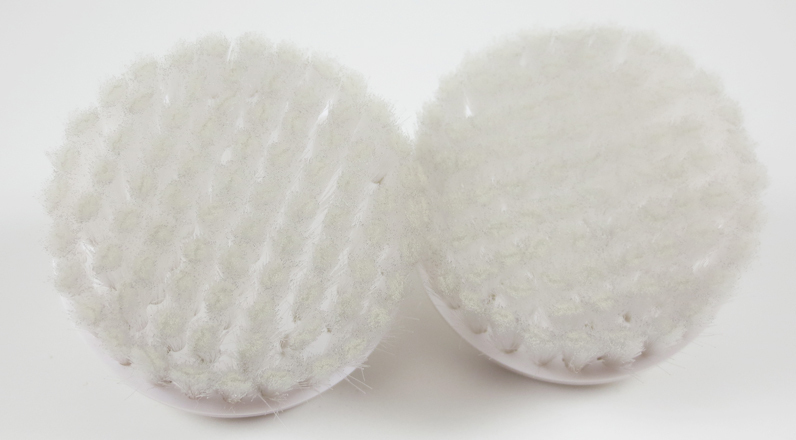 The texture and feel of this brush is similar to the Clarisonic brush heads, only the bristles on this head are are about double the length on the Clarisonic bristles. It does a nice job of cleaning and smoothing large areas of skin. I use this almost exclusively on my neck, chest and shoulders. Here is a quick comparison photo of some Spa Sonic Heads and a Clarisonic head. These were all damp, hence the tissue paper back drop. Also, I smooshed the body brush head in a mesh bag so the dent there is my fault. You can see the Spa Sonic Small Face Brush on the left, the Clarisonic Sensitive Brush Head in the middle and the Spa Sonic Body Brush on the right. I think most people looking at this product want to know if this is similar to a Clarisonic. The answer is yes.....and no. The big difference between the two products are the brush head mechanisms. The Clarisonic vibrates, the Spa Sonic rotates. Here is a link to video posted by 15 Minute Beauty Fanatic showing the Clarisonic and the Spa Sonic side by side. So you can see when you view these two products side by side they function quite differently. But does that effect how the product cleans and exfoliates your skin? Not really, at least not in my opinion. When I tested the Spa Sonic Skin Care System, I cleaned one half of my face with the Spa Sonic Skin Care System and I washed the other half with my Clarisonic Plus. I disregarded the usual timing feature of my Clarisonic and I used them exactly for the same length of time on each side. When I clean my face with my Clarisonic it leaves it with a distinctly clean and smooth feel. It's unmistakable for me. So how did my skin feel after using the Spa Sonic? Exactly the same! After using both products I could not feel any difference between the two halves of my face. Now, there are some distinct differences worth noting. First, the rotating vs vibrating brush heads. While they seem to yield the same end result, the Spa Sonic rotating heads take getting used to. I was used to moving my Clarisonic across my skin in a circular motion. However, when I did this with the Spa Sonic the wand sort of wobbled and lurched across my skin. I had to learn to just glide it across my skin, not move it in circles. The second difference are the brush head sizes. At first, I thought the smaller brush head was going to be a drawback, however, it turned into a big plus in my book. One of my problem areas is my nose. The skin is flaky, prone to black heads and redness and using the Clarisonic on my nose has been comical. I have to stick one finger up my nose and wiggle my nostril around to fit the Clarisonic in the relevant crannies. I hate that! However, the smaller and softer brush heads fit around my nose perfectly! The fact that the head rotates just makes it that much easier. The third difference worth noting is the absence of a base or brush cover. This is one thing I wish the Spa Sonic had. 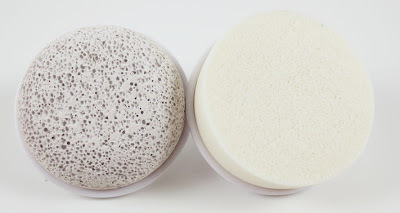 I like to keep my skin care systems in the shower, but I wont do that without a brush cover. Right now, I keep my spa sonic in a mesh bag that hangs on the outside of my shower door. It works, but it is not my ideal since it can smoosh the brush heads. I could find other storage alternatives, but hey, I'm lazy. The last and perhaps biggest difference is the price. 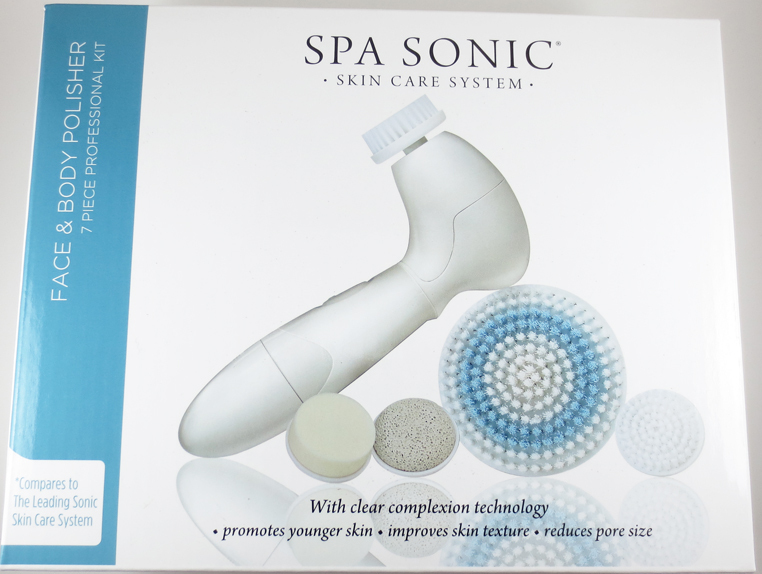 You can find the complete Spa Sonic Skin Care System at retailers like Target for about $60. Replacement heads cost about $10-$11 dollars for two! A single Clarisonic replacement head will run your $25 I haven't used the Spa Sonic Skin Care System long enough to tell you how long a brush head lasts, but I can tell you my Clarisonic has fell silent for months at a time because I could not bring myself to cough up $25 for a replacement head. The Spa Sonic Skin Care System has a lot going for it. First, it has a very comfortable price point. It retails for about $60-$70 (varies by retailer) compared to $120 for an intro Clarisonic Mia. Both the Spa Sonic and Clarisonic Mia offer a single speed wand that cleans and exfoliates. With The Spa Sonic Skin Care System, you also get 3 additional, unique brush heads. The Spa Sonic wand isn't quite as sturdy as the Clarisonic, but I threw it on the floor once by accident and I found it handled the impact quite well. The rotating head mechanism, likewise does not feel quite as solid as the Clarisonic, but the product cleaned my face identically and in the case of my nose, more easily then the Clarisonic. I think if you are in the market for a skin care cleaning system and the Clarisonic is giving you some sticker shock, then you should check out the Spa Sonic Skin Care System. It does what it says it will do, they make a variety of brush heads, half of which Clarisonic does not offer and does it for half the price. It also comes in a variety of colors and can be purchased from several major retailers including Target, Walmart, Walgreens and CVS. Price: $60-$70 depending on the retailer. Until May 5th 2013 you can purchase the Spa Sonic Skin Care System at Drugstore.com for $49.99 this is a really great deal and makes a great gift for Mother's Day!